Helpdesk ticketing systems help reach companies track and manage customer communication and engagement across social media, submission forms, on the phone, via email, and through live chats. Helpdesk CRM dashboards are what keeps all these communication channels organized, offering users advanced, customizable, visual reports, ticket statuses, and organize tickets based on deadlines, priority, or complexity. CRM software data, in general, can get out of hand quickly if not well maintained. For helpdesk CRM software, keeping customer data organized is imperative because support teams are the ones who deal with customers directly. If the customer’s problems are lost in a sea of data and their problems go unsolved, or they have to continuously follow up with your business, it shows you’re unorganized at best. At worst, you’ll look like you don’t care, and in this trust economy, the last thing your business needs is a reputation on social media that you don’t prioritize customer experience. We’re going to discuss what features to look for in a helpdesk CRM dashboard, why they’re important, and where you can find them. Ultimately, it’s up to you to determine what fits your company’s needs, but there are some essentials that shouldn’t be ignored. Some of you, I’m sure, already know what helpdesk CRM software is, and are interested in improving and customizing your helpdesk CRM dashboard to only display what is absolutely essential to the success of your customer support efforts; however, I’m sure there are some of you who are new to CRM software in general and have heard “helpdesk CRM” or “helpdesk software” being thrown around, but aren’t exactly sure what it means. The way helpdesk CRM software differs from sales CRM software is through emphasis on customer support options. Helpdesk CRM often offers advanced reporting on tickets made and the time it takes to resolve them, knowledge bases for customers interested in self-service options, and powerful, multichannel integrations that allow businesses and customers to interact via social media, community forums, phone, email, live chat, and chatbots. We’re not going to get too carried away with this because we already have. If you’re ready to dive a little deeper into this rabbit hole, everyone else is doing it. Don’t miss your chance. Helpdesk ticketing solutions can be hard to differentiate from one another when it comes to the kinds of features they offer. They’re, for the most part, about making sure you have the right tools to handle whatever issues customers throw your way. Helpdesk CRM dashboards all emphasize organization and visualizing customer satisfaction and ticket reports. Below is a list of common helpdesk CRM dashboard features that you can find with almost every provider. To be clear: we’re not saying to avoid these features or that they won’t give you a competitive edge because it’s ultimately up to you to decide what’s right for your business. This list is for those who are new to the game and need a foundation. If you’re interested figuring out of helpdesk software is right for you, read our list of ten points to consider when choosing a helpdesk. People are visual learners. We stare at our phones and computers for an unhealthy amount of time every day. We take in so much visually-unappealing data that can no longer be separated from what actually matters. Charts and graphs help break up the monotony of customer data, and they’re placed front and center in helpdesk CRM dashboards for businesses interested in seeing results, rather than reading them. On the right side of the picture above, you can different kinds of data being tracked: “Resolved,” “Received,” “Average First Response Time,” and so on. Helpdesk CRM dashboards all offer these kinds of data tracking because sometimes the numbers simply speak for themselves. In many cases, the data your business tracks can be customizable, which helps cater to your specific needs. At this point it goes without saying that mobility is an absolute necessity. Customer inquiries and issues do not go away when you leave the office. Providers nowadays understand this and give businesses the ability to view their dashboards anywhere and on any mobile device. Customers appreciate immediate responses and mobility gives businesses that option. 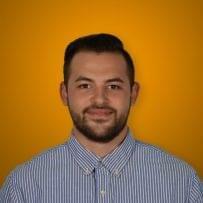 Customer support teams run almost entirely on tickets customers produce. 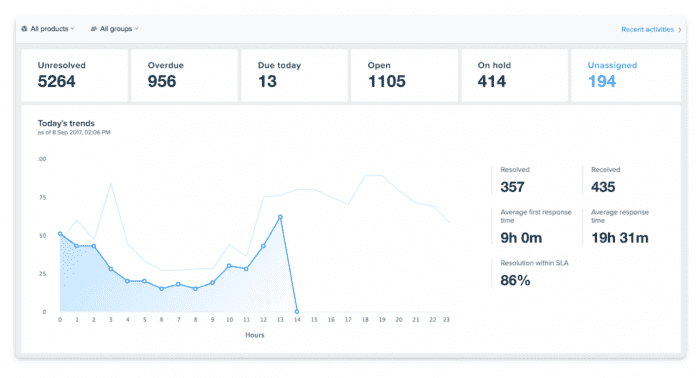 Ticket dashboards, like this one from Zoho Desk, help businesses monitor how long it takes to reply to tickets, what the response time is, and which channel those tickets are coming from. Having those front and center is a good way to prioritize every issue customers bring to your business’ attention. Businesses use SLA agreements and less formal deadlines with their customers and clients to ensure every ticket is accounted for and handled in an appropriate amount of time. Helpdesk CRM software’s primary purpose is to make solving problems easier and quicker, so it makes sense for providers to include scheduling features on their dashboards. Businesses can see how much time each ticket has left before it’s too late and how many tickets there are in order to make SLA agreements more reasonable. On the bottom right of the second picture, you can see a happiness rating chart, which, presumably, is for how customers felt about the help they received. If your business is trying to improve customer satisfaction ratings, then it goes without saying that these numbers should be front and center on your dashboard. Customer service providers often include these kinds of reports because customer experience is a top priority for helpdesk CRM software. If there are agents who have high performance ratings, it’s good to know who those agents are so they can take on tougher cases. One key indicator of how good or bad they’re doing is by checking their ticket backlogs. Regardless of how many or how little tickets each agent has, it can be accessed on the dashboard to help determine who should get tickets and who already has enough on their plate. There’s typically not just one dashboard businesses can use to cover every single element to customer support. If you want a dashboard that only displays ticket metrics, or a dashboard that focuses entirely on customer satisfaction, most providers give their customers the ability to create and design their own dashboards. Cycling through multiple dashboards organizes all your customer data even further. Now that the basics are out of the way, we can focus in on the important stuff. These features are what we consider to be essential for a more powerful helpdesk CRM dashboard. They’re not hard to find, but you need to know where to look. We’ll get to that in a little while. For now, let’s break down these key features. Like we said before, tickets are often a top, if not the top, priority for helpdesk CRM software. Businesses, regardless of size, deal with issues customers bring to their attention on a regular basis. Your helpdesk CRM dashboard should have ticket overview features that show the number of tickets created and organize tickets based on priority levels. When your business prioritizes ticket overview, the odds of tickets being lost in all your customer data decrease significantly, which, in turn, increases positive customer experiences. 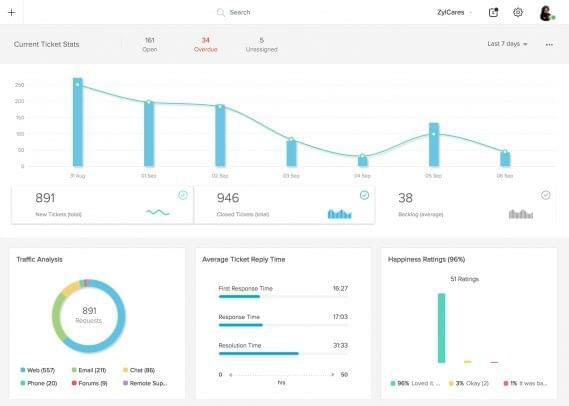 Create a dashboard specifically catered to ticket overview that showcases specific ticket metrics. The time it takes your business to respond to tickets can make all the difference in customer experience. Businesses who lose tickets and don’t respond to customer inquiries, or don’t make the effort to respond quickly, struggle to keep their customers happy. When businesses respond within the hour, the likelihood of resolving the problem and having a positive customer experience increases. 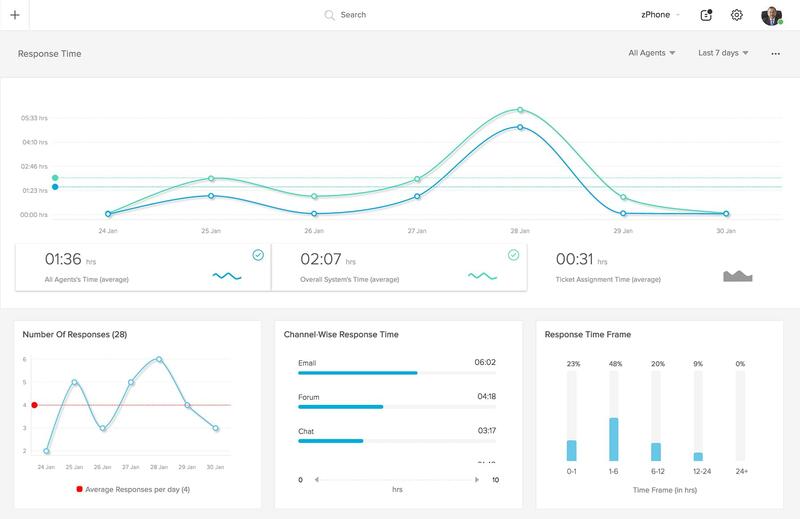 Some time-based metrics that could improve your helpdesk CRM dashboard are First Response, Average Response Time, Average Resolution Time, and Ticket Life Cycle. Prioritize time management to ensure each ticket gets the attention it deserves. Not all providers offer gamification features, but some give businesses the ability to keep score of all different kinds of metrics, including the ones just mentioned. Gamification is a great tool that’s growing in popularity. Businesses use it to make mundane tasks feel less pointless. It’s not a mistake you seeing Mobility twice in this article. The significance of mobility warrants extra attention. Just about every helpdesk CRM provider is going to offer mobility features and apps for iOS and Android, but it’s important to make sure that they’re also providing scalable dashboards that can be viewed from anywhere. Pick a provider that offers powerful mobility features for helpdesk CRM dashboards. If your business relies on remote, customer support agents, mobility features could help them handle customers from multiple channels without having to be in the office. We’ve mentioned a couple times already that dashboards should fit your business’ needs, so it shouldn’t be a surprise to see this here. This should be your top priority. Providers can offer your business all kinds of charts and graphs and KPIs that claim to help all businesses, but that’s hardly ever the case. What tends to happen is that there’s too much information and no one knows what to do with it so it goes unchecked. Helpdesk CRM dashboards should offer businesses the ability to choose what KPIs they want measured and smart views, which means businesses can choose what they want to see and don’t want to see. Ask agents which KPIs are most valuable for them, and highlight those on the dashboard. So where can you find all these providers and solutions we’re constantly speaking of? For starters, you can try our helpdesk provider page. You can find all the information you want on helpdesk software and providers there; however, here, we’re going to simply state who offers what and any interesting new products to consider. Freshdesk: Freshdesk is an all-in-one helpdesk software that helps businesses manage tickets, offers collaboration-in-real-time features, supports multiple channels, automates time-consuming tasks, offers customers self-service options, provides powerful reporting and analytics, allows full customization of reports and dashboards, and securely stores all customer data. Freshchat: Freshchat is a new product built specifically for live chats. The bot acts more like a sidekick, which can jump in on conversations to capture leads, validate and qualify responses, and auto-upload them into your CRM. Freshchat offers an interactive dashboard that integrates with your CRM software to ensure all the information you acquire is relevant to your helpdesk needs and goals. Zendesk Explore: Zendesk Explore hasn’t been released yet, but according to their website, Explore “enables anyone to create custom metrics, reports, and dashboards, and even perform data joins—without SQL. Data gets turned into meaningful analyses with point-and-click functions and visualization styles.” Dashboards can even be shared across your business, which makes the product even more powerful. Zoho Desk: Zoho Desk is a powerful, context-aware helpdesk software. Agents, managers, and customers are all provided with the right tools to ensure customer experience is always the priority. 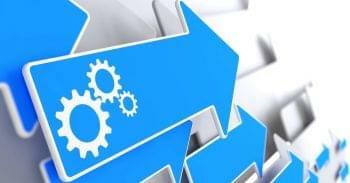 Some of these tools include automating tasks, omnichannel capabilities, and self-help options for customers. 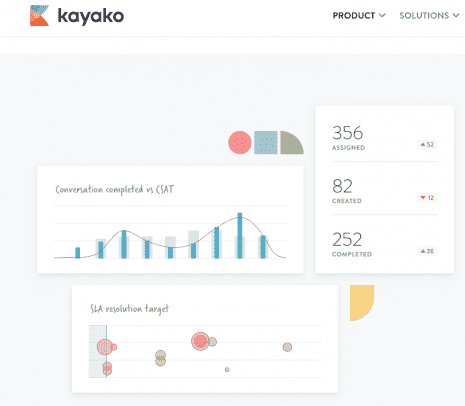 Kayako is a dedicated, helpdesk CRM software provider that offers a customizable dashboard for businesses. They emphasize their multichannel options for businesses looking to reach out to their customers in different ways that leaves no one left out. They also focus on self-help options. Salesforce Desk: Salesforce desk offers businesses a dashboard that can be customized with agent performance reports and business insights, which can be tailored to your business’ specific needs. This information can also be shared across the company, meaning everyone stays on the same page and customer support improves significantly. HappyFox is a cloud-based helpdesk software that offers mobility features, is customizable, and can integrate with other apps and software. It comes with everything you’d expect in a helpdesk CRM software, including a dashboard that can be fitted to your businesses needs, showcasing specific KPIs and other analytics. Agile CRM does much more than helpdesk CRM software, being one of the top CRM software providers for businesses of all sizes; however, their helpdesk software features are worth nothing. These features include ticketing, smart views, SLAs, smart workflows, canned responses, and graphical reporting. They offer a dashboard that lets you see all these reports and maintain high levels of customer satisfaction. Knowing what to look for in a helpdesk CRM dashboard can make all the difference for your business if you’re struggling to to reach your software’s fullest potential. Most features today offer businesses the ability to customize their dashboards to however they see fit. Each solution comes with tons of features that can be found with any other helpdesk CRM solution, so it’s important to pay attention to the key features we listed earlier if you want to give your business’ support team the best tools for improving customer experience. A helpdesk CRM dashboard is the foundation for how the software works, so it’s imperative to prioritize finding a solution that is built to or is powerful enough to adapt to your business’ needs. This is important because if your support team is given software that doesn’t make their jobs easier, they won’t be nearly as effective at handling problems as they arise.